倉田喜弘. 日本レコード史. 岩波現代文庫. 2006. 318 p.
前島正裕（国立科学博物館理工学研究部研究主幹）. 音の博物館 蘇言機：日本で最初に音を記録再生した器械. 日本音響学会誌 65(2), 2009. p.105. 生明俊雄. 英国からの黒船 ガイスバーグの来訪：日本のレコード市場生成期における欧米メジャー企業の攻勢. 広島経済大学創立四十周年記念論文集, 2007. pp.833-856. Jerry McWilliams. The Preservation and Restoration of Sound Recordings. The American Association for State and Local History, 1979. A. G. Pickett., M. M. Lemcoe. 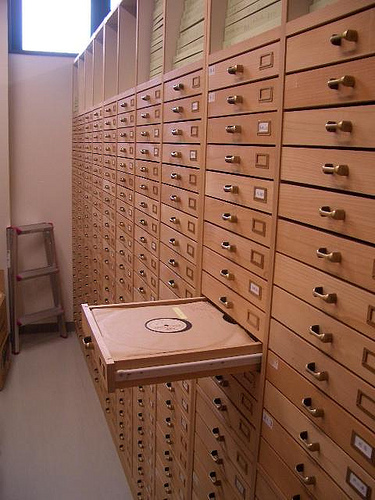 Preservation and Storage of Sound Recordings. Library of Congress, 1959. Reprinted by ARSC, 1991. Ken Howarth. Preservation and Storage of Sound Recordings., 1987. Society of Archivists., (Society of Archivists Information Leaflets). 録音資料の媒体変換に係るガイドライン調査報告書 第1版 国立国会図書館の委託調査に基づく報告書. オタリ株式会社, 2011. キーピング・アーカイブズ 第3版. オーストラリア・アーキビスト協会, 2008., (17章 音声記録).